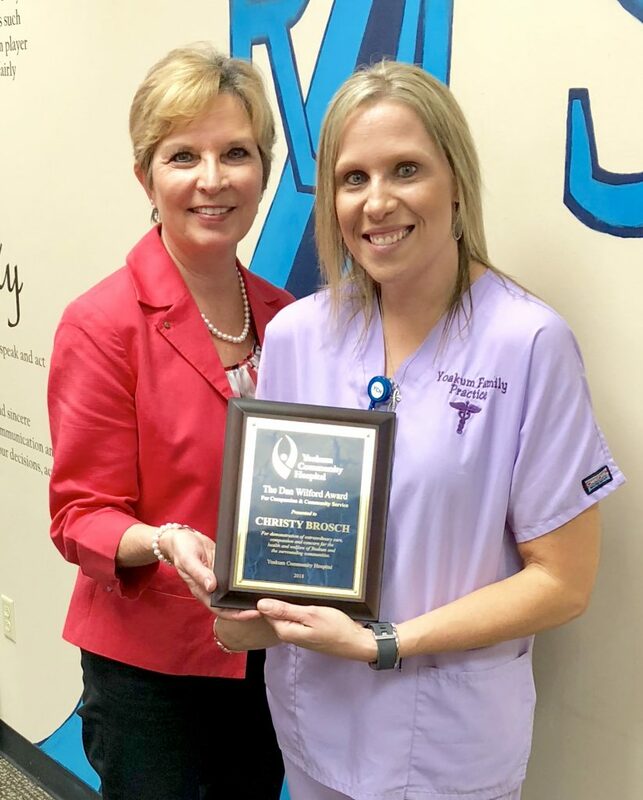 Yoakum Community Hospital employee, Christy Brosch (Yoakum Family Practice), was officially presented with the 2018 Dan Wilford Award for Compassion and Community Service on Wednesday, April 18th, by YCH CEO, Karen Barber. A call for nominations by co-workers was sent out and Diane was selected by an appointed Nomination Committee at YCH. Community Hospital Corporation in partnership with its hospitals, sponsors the Dan Wilford Award each year to recognize one caring, compassionate and humanitarian employee from its hospitals corporate-wide. Christy was chosen for exhibiting the following criteria in her day-to-day work ethic: remarkable concern for the welfare and happiness of patients, significant contributions to the improvement of their community’s health and welfare, a level of commitment to community service beyond the daily operation of the facility, extraordinary acts of kindness, positive effect on others, and for being coming competent, consistent and people oriented. Christy is now in the running for the CHC Corporate-wide Award to be presented in the May/June timeframe. CHC will select one of the submitted hospital winners to represent the group as the single winner of the CHC Dan Wilford Award for Compassion & Community Service. Shown from left to right: Christy Brosch and Karen Barber (CEO).